I want to be patient. I want my business to grow within its means. I don't want to incur debt. I will hold back the charging bull. I will continue to live my life. I will learn every day. I will let go of the reins when it's ready. I will not be greedy. I will succeed. Only 3 results found. 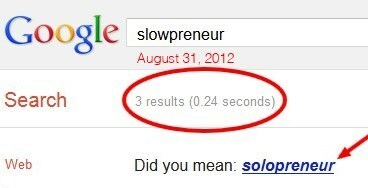 Slowpreneur was born. In a world of 80 hour work weeks, startup sacrifice, and no-holds-barred entrepreneurship, you strive to be different. You want a better world right now, for you and for those that are important to you. You are the new standard of success.